To watch Rachel Podger direct Brecon Baroque at the York Early Music Festival this summer, as I did, was to see an artist so alert, alive and joyous in her music-making, and yet so relaxed and modestly self-confident, that it almost didn’t matter what the music was. Here was someone totally at ease with her own artistic personality, uninhibited in communicating it with phrase and gesture, and seemingly still deeply in love with the act of playing the violin, especially with friends. The audience adored her for it. But then, Podger has followed her own path from the outset: warned off playing Bach when she was 12 (it requires another 20 years’ toil, apparently), and later discouraged from studying Baroque violin in her first year at the Guildhall School of Music and Drama in London (you were supposed to wait to the second year), she ignored such baffling advice and got on with it. From those Guildhall years she emerged in the 1990s as a member of two dynamic young Baroque ensembles, the Palladian Ensemble and Florilegium. At the same time, her rush of red hair (and an even redder dress!) was making her a striking figure as Leader of Trevor Pinnock’s English Concert and Paul McCreesh’s Gabrieli Players. She also made an impact, on disc and at the Proms, as a partner to Andrew Manze, the decade’s other young British star of the Baroque violin, in Bach’s Double Concerto. She had not waited her 20 years, then, and indeed by the time the century was out she had dared to record all of Bach’s Solo Sonatas and Partitas. Back then that was a brave undertaking for even the most experienced of Baroque violinists, but Podger achieved it with almost nonchalant ease and lack of fuss. Twenty years on again, hers is still a benchmark recording. Since then she appeared more and more as director, at first as a guest with orchestras such as Arte dei Suonatori (with whom she won a Gramophone Award in 2003 for Vivaldi’s Op 9 Concertos), and then, from 2007, with her own group, Brecon Baroque, largely formed from friends and former pupils and named after the town in Wales where she now lives and directs a delightfully unpretentious festival. Meanwhile another Gramophone Award came along in 2016 for Biber’s ‘Rosary’ Sonatas. There seems little reason to suppose that there won’t be more to come. That music in York, by the way, was Vivaldi’s Four Seasons, presented with an effortless freshness and delight in detail that also drives the recording (‘self-recommending’, according to our own Editor) released earlier this year. A present to herself in her 50th birthday year, and shared with the ensemble fired by her irresistible personality, it could hardly have come at a more fitting moment. We are happy to contribute our own celebratory gift in recognition of an inspiring and immensely popular musician. 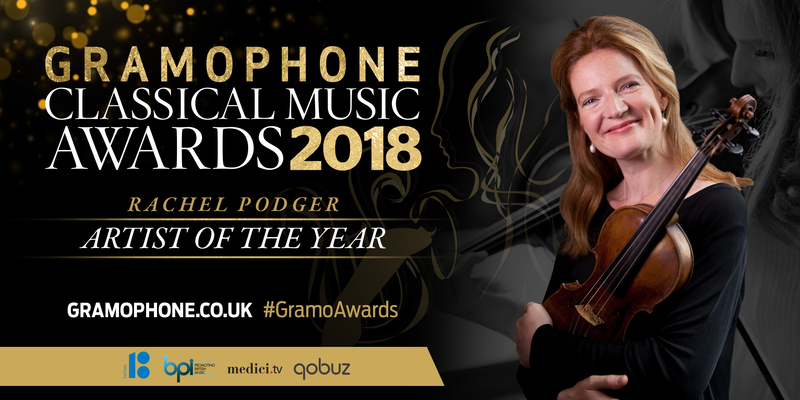 The Sunday Times once called Podger ‘the Queen of the Baroque violin’; so serene has been her rise to pre-eminence, it is hard to argue against the title being richly deserved.